Your Daily Cute: Two Cats Tuesday: Little Meow and Her New Brother! We've got everything crossed that she's found her forever home!! Oh Wow, that is such great news. I was hoping that might happen. Little Meow looks like she is so happy. That has a lot to do with your good care and love all these years. Good job Dorian. I am like you, Wow. I was really pulling for Little Meow to find a good home. Hooray! That is wonderful news! That's good news! Good luck, Little Meow! I hope that all works out for "Little Meow" and that she has found her "furever" home. Things always work out just the way they are supposed to. How could Shongy not love Little Meow?? This is great news!! Yay!!! All the rescues that have happened this past week have sure made us happy!! 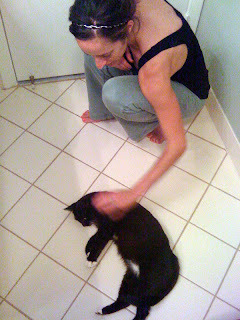 We are purring that this all works out for Little Meow (and Shongy, too, of course!) It looks like such a great place for her. 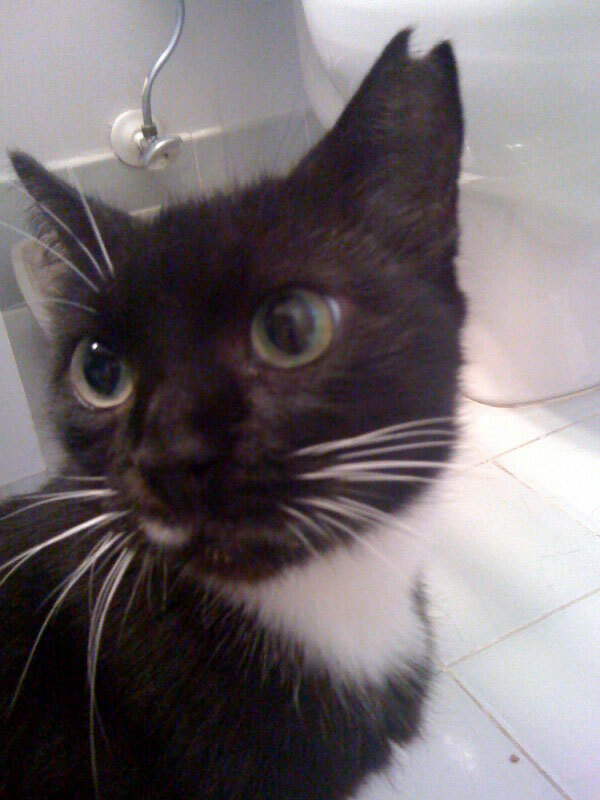 Many thanks and purrs to Giselle and to the other people who offered to give Little Meow a home! WONDERFUL!!! We are purring for Little Meow and Shongy to get along and be new brofur and sisfur! We love to start off the week to great news like this! How WONDERFUL! Have they been introduced yet? I'd be so happy for you if Little Meow was somewhere you could visit her all the time! If I come back as a cat I want you to be my human please! OH, Shongy is a very attractive young man! My sisters and I are all purring that this will work out, that would be totally wonderful!!! We really hope this works out for Little Meow - it looks purrfect. We are sending lots of purrs to both Little Meow and the very handsome Shongy, plus purrs and thanks to Giselle and the other people who offered to help Little Meow find a home! And don't forget about Jabba, now Jada, the Texas kitty dumped at a shelter and ready to give up on life -- until she found her forever-home thanks to a Craigslist posting that was shared on Facebook! Oh, wow, I am so happy for you guys!! Shongy looks really sweet. We hopes they become best friends fast. We put it on our facebook page. This is absolutely wonderful news! We so hope this will work out for Little Meow and your friend. 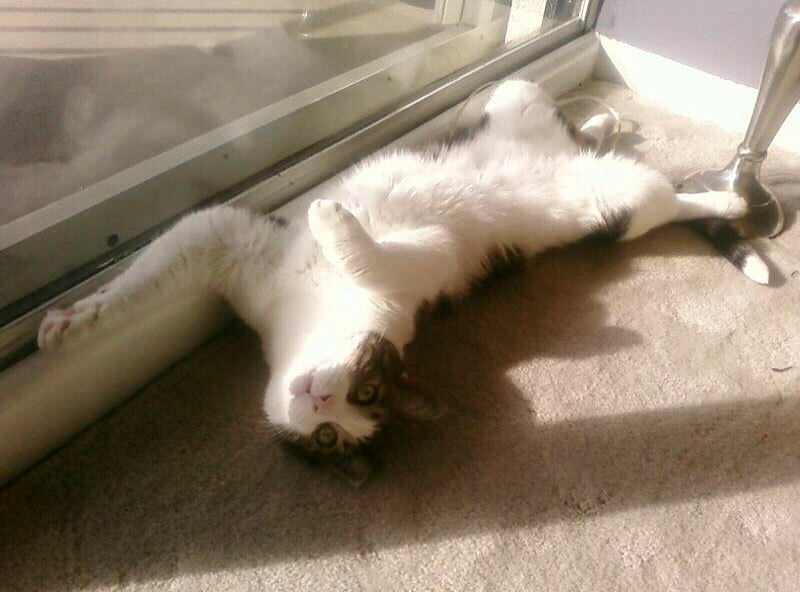 Paws crossed that Shongy falls in love with Little Meow as much as the rest of us have! Yay, the comments are all back! So happy for Little Meow! Thanks to you she'll be safe an happy for years to come! I'm so glad that it looks like Little Meow has a home. Also that it's near you and you can go visit her sometime since you love her so much. She looks so much like a male cat I adopted named Fidgit that it's scary. He was in front of Denny's, was smart and sweet and in charge quite quickly. Thanks for looking out for parking lot kitties, they are some of the best!! This is good GOOD news. You must be thrilled, and totally relieved. DashKitten was proud to add his blogging voice to those of Brew and Rumblepurr circulating the call for help and he just posted the good news on his blog. You are good to look out for Little Meow and the car park kitties. Brew and I are SOOOOOOOOOOOOOO happy to hear this! Go Little Meow!!!! forgot to add, that both Little Meow and Shongy are beautiful kitties..This will work out!! Hooray! I love a happy ending!! Happy new life for little meow! This is such wonderful news! We're purring it all works out for Little Meow! Shongy is a very handsome brofur and we hope like anything that he likes her! Hooray Hooray! I am keeping my fingers crossed for this sweet kitty! It seems like she knows a good deal when she sees it. What a wonderful job you did finding her a home ~ good for you! We all thank you! 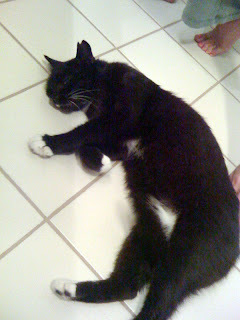 I am so happy that Little Meow has found a new home and is no longer alone with Daddy. Wonderful news.